Megaloblastic anemias are a group of disorders characterized by reduced DNA synthesis (not just in red cell series) associated with pathognomonic morphological changes. When DNA synthesis is impaired, the cell cycle cannot progress from the G2 growth stage to the mitosis (M) stage. This leads to continuing cell growth without division, which presents as macrocytosis. In other words, megaloblastic anemia is a condition in which the bone marrow produces unusually large, structurally abnormal, immature red blood cells (megaloblasts). Macrocytosis is a term used to describe erythrocytes that are larger than normal, typically reported as mean cell volume (MCV) greater than 100 fL. The amount of hemoglobin increases proportionately with the increase in cell size. Therefore, if the increase in MCV is not related to macrocytic anemia, the mean cell hemoglobin concentration (MCHC) also increases in proportion. Causes of macrocytosis are many and range from benign to malignant; thus, a complete workup to determine etiology is essential. Macrocytosis may occur at any age, but it is more prevalent in older age groups because the causes of macrocytosis are more prevalent in older persons. The defect in red cell DNA synthesis is most often due to hypovitaminosis, specifically a deficiency of vitamin B12 and/or folic acid. The pathological state of megaloblastosis is characterized by many large immature and dysfunctional red blood cells (megaloblasts) in the bone marrow and also by hypersegmented neutrophils (those exhibiting five or more nuclear lobes “segments”). These hypersegmented neutrophils are found in the “peripheral blood”. Nutritional deficiency (especially common at the extremes of age and in alcoholics). Malabsorption (absorbed mainly in upper jejunum): gastrectomy, coeliac disease/tropical sprue, extensive Crohn’s disease, and phenytoin which interferes with folate absorption. Increased requirements: including pregnancy, lactation, rapid growth, hemolysis, malignancies and repeated dialysis. Defective folate utilization: seen with antifolate drugs, some anticonvulsants, and alcohol. Vitamin B12 occurs in foods that come from animals. Normally, vitamin B12 is readily absorbed in the last part of the small intestine (ileum), which leads to the large intestine. However, to be absorbed, the vitamin must combine with intrinsic factor, a protein produced in the stomach. Pernicious anemia of immune origin leading to failure of intrinsic factor production. Intrinsic factor deficiency secondary to stomach surgery. Terminal ileal disease (site of B12 absorption). Competitive parasites, especially bacterial overgrowth with “blind loops”. Nutritional deficiency in vegans and alcoholics. Toxins and Drugs: e.g. methotrexate, cytosine arabinoside, phenytoin, 6-mercaptopurine, azathioprine, trimethoprim, and alcohol. The tyrosine kinase inhibitors sunitinib and imatinib have been shown to induce macrocytosis in patients with a variety of cancers, including renal cell carcinomas (RCCs), gastrointestinal stromal tumors (GISTs), and breast cancer. 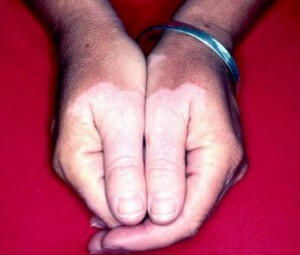 Rare causes: certain inborn errors of metabolism and copper deficiency resulting from an excess of zinc. A very insidious onset of anemia. Hemoglobin (Hb) may be as low as 2 g/dL at presentation! Anorexia (loss of appetite) and glossitis (inflammation of the tongue) are common. There may be fever, recurrent infections, petechiae (tiny skin and mucous membrane bleeding) in severe cases. Subacute combined degeneration of the spinal cord can occur with severe B12 deficiency. Low Hemoglobin with a raised MCV. In the early stages, macrocytosis appears before the anemia. 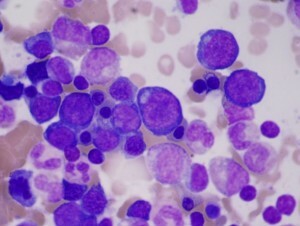 The red cells show anisocytosis, poikilocytosis and may contain inclusion bodies. 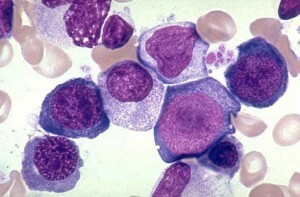 The neutrophil count is often reduced and multisegmented neutrophils are characteristic. The platelet count is often reduced. 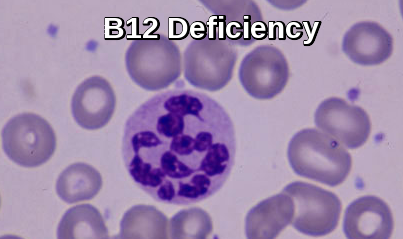 Indirect bilirubin level may be elevated in pernicious anemia (intramedullary hemolysis). The serum lactate dehydrogenase (LDH) concentration usually is markedly increased in pernicious anemia. Intrinsic factor (IF) antibodies, type 1 and type 2, occur in 50% of patients with pernicious anemia and are specific for this disorder. Anti-parietal cell antibodies (APCA) are an advantageous tool for screening for autoimmune atrophic gastritis and pernicious anemia. The bone marrow is hypercellular with megaloblastic changes in both the red and white cell series. Treat any underlying cause if possible. Replace deficient hematinics: B12 is given by intramuscular injection (i.m. 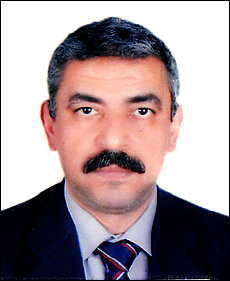 ), initially give 1000 mcg hydroxycobalamin twice weekly i.m. for one week, then 1000 mcg i.m. once weekly until the blood count is normal, then 1000 mcg i.m. at three monthly intervals for life. Folate should not be given in B12 deficiency as it may exacerbate the neurological condition. Folate 5mg daily is usually given orally even in malabsorption. If B12 and folate deficiency coexists, correct B12 deficiency first! Hoffbrand AV. Megaloblastic Anemias. Kasper DL, Fauci AS, Hauser SL, Longo DL, Jameson JL, Loscalzo J. Harrison’s Principles of Internal Medicine. 19th ed. New York, NY: McGraw-Hill Education; 2015. Wang YH, Yan F, Zhang WB, et al. An investigation of vitamin B12 deficiency in elderly inpatients in neurology department. Neurosci Bull. 2009 Aug. 25(4):209-15. Kaferle J, Strzoda CE. Evaluation of macrocytosis. Am Fam Physician. 2009 Feb 1. 79(3):203-8. Schallier D, Trullemans F, Fontaine C, Decoster L, De Greve J. Tyrosine kinase inhibitor-induced macrocytosis. Anticancer Res. 2009 Dec. 29 (12):5225-8. Megaloblastic anemias are a group of disorders characterized by reduced DNA synthesis associated with pathognomonic morphological changes. Great information. It will be very helpful for me. Thanks.